85(10*4 & 5*6) from juz 35 balls made Chargers to enter into finals in IPL.Gilly won the toss and asked Delhi to bat first. Daredevils lost 2 early wickets in first over itself.But Sehwag and Dilshan played tremendously well which made Delhi Daredevils to score 153/8 in 20 overs.Paul Harris Scalped 3 wkts and Purple Cap boy RP scalped 2 wkts. 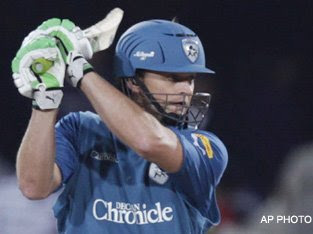 So Hyderabad in return started their innings swiftly where Gilly hit 5 consecutive boundaries in the 1st over of Nannes.Gilly also recorded the fastest 50(17 Balls) in IPL.At the end of 10th over ie last ball before startegic time out Gilchrist was out by Amit Mishra because of top edge of a slog sweep ,made him to put in the hands of Nannes.After that Hyd played progessively to reach the target and because of the impressive innings of Symonds(24) and Suman(24*),Hydreached the target easily in 17.4 overs.From Delhi side no bowler is impressive other than Amit Mishra with his impressive 19/3 in 4 overs.